Katariasar Village, located at 45 km from Bikaner on the Jaipur road and about 50 minutes in driving time, is a popular tourist destination to experience the Rajasthan village life first hand. 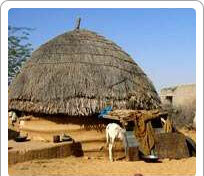 The village is populated mainly with a tribe known as Jasnathji, who are fire dancers. The chief occupation of the villagers is milk farming. Animal life is aplenty and Chinkara, Desert Fox, Peacock, Rabbit, Parrot and Partridge abound. Also enjoy a walk on the sand dunes and view a typical desert sunset before returning to your hotel.